We all want to enjoy our favourite foods whilst still staying in shape right? Well fortunately, with these easy weight loss and metabolism boosting drinks keeping your body in fat burning mode can be just just a few easy to prepare beverages away. This means you CAN indulge in the occasional treat whilst still keeping your metabolism firing on all cylinders. It’s often hard when trying to obtain the body you desire to actually do what it takes to achieve this, such as cutting out those tasty comfort foods that aren’t always great for the waistline. Not only is it hard, but it can make your life an absolute misery what with the constant calorie and fat counting – life’s just too short for this malarkey, and besides there are much easier ways to stay trim. Read on and find out just how you can achieve this with the addition of these delicious fat burning drinks. Now I’m not saying you can just gorge on everything you like, or do no exercise and expect to not gain weight – of course not. But once you get the balance right with healthy eating, exercise, plus still enjoying your life AND food, then you will be happy and contented; and best of all slim! As well as using these specific drinks to help speed up your metabolism you should also incorporate into your diet specific fat burning foods as these will help to keep your body in negative calorie equity too. The more fat blasting foods and drinks you can add into your diet the better, plus they help towards filling you up on good stuff instead of the bad. Many of these drinks can be made really inexpensively out of your store cupboard staples, which is great as no shopping is required! Always remember to drink at least 1.5-2 liters of fluids per day; more in the summer, OR during intense exercise. 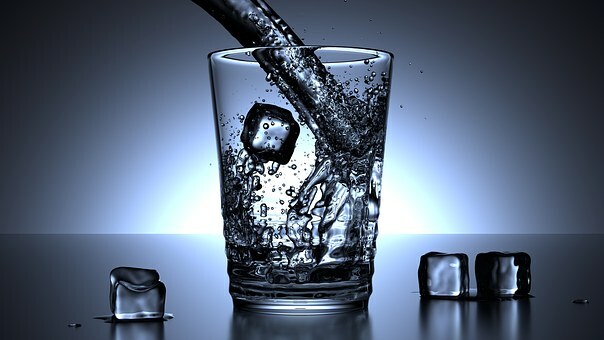 Proper hydration in itself, can not only help keep you full, but also stop sugar cravings and ultimately keep your weight stable, so never underestimate this fact. Yep, coffee, be it good or bad, is actually a fantastic and proven energy drink AND metabolism booster rolled into one; and a couple of cups of coffee before a gym workout (or any other kind of exercise for that matter) has been proven to give you the stamina you need to go at it for harder and longer periods. A study conducted by the ‘Journal of Sports Medicine and Physical Fitness’ discovered that after a couple of cups of black coffee, weight trainers could do nearly 20% more repetitions on the leg press machine than without it. If you can tolerate caffeine (some people can’t), then being able to do longer and harder periods of exercise will mean extra weight loss. But I would only recommend having this much caffeine if you are actually going to burn it off immediately, otherwise you may end up with possible negative side effects such as palpitations and anxiety. Caffeine has long been proven to boost metabolism, which is the reason why it is in so many natural weight loss supplements. However, sometimes the effects can be short lived as your body becomes more and more tolerant to it with continual use. So bear in mind that you may not get the same effects forever, and also think about taking breaks to reset your caffeine tolerance. Remember to take the coffee black and without sugar; or at least use a healthier sweetener alternative if you can. This is because the fat and proteins in milk before a workout will not be beneficial to your training and may even counteract what you are trying to achieve, plus refined sugars are just not good full stop. Fantastic for fat burning, and ultimately weight loss, green tea contains catechins and antioxidants that can help increase metabolism by up to 4% over a 24-hour period. This may not seem like much, but think of how it will add up over time if you decide to swap your regular tea for the potent green stuff. In fact, 4 cups daily can help you to burn up to 70 CALORIES extra a day, which works out 490 a week, and 1,960 every month. That’s a whole days worth of food! 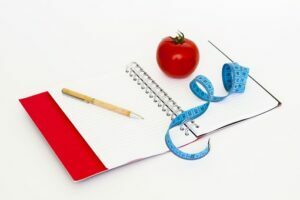 And we’re talking the loss of stomach fat specifically here, which is the dangerous kind that may significantly up your chances of type 2 diabetes, heat disease, and metabolic syndrome. Sounds too good to be true I know, but true it is. Cold drinks push the body into burning more calories in a frantic bid to maintain its core temperature of 98.6 degrees. Drinking just 3 glasses a day can boost your body into burning an extra 100 CALORIES. That’s 700 a week, and 2,800 a month… you get the idea! Even though your body will actually react this way to all cold beverages, it really is best to stick to just water as anything else will just mean extra calories, or the addition of nasty artificial sweeteners. For instance, if you decide to have a coke with ice instead of water, then the benefits will be lost because of the high amounts of sugar and calories. Same goes for anything else you may add – especially don’t try to swap to 3 glasses of diet soft drinks, as all those chemical sweeteners have been shown to promote weight gain in the long term, and could also have lots of other unwanted side effects. 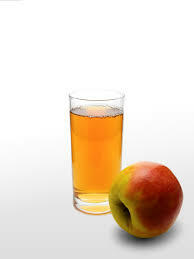 The compound acetic acid found in apple cider vinegar can help increase energy expenditure and suppress body fat mass. At 1-2 tablespoons a day it can boost feelings of fullness, lower blood sugar, AND suppress appetite. Amazingly, 30ml of apple cider vinegar before a high carbohydrate meal can make you feel highly satiated, due to the fact that it lowers the GI (glycemic index) of your entire meal. This has been shown in studies to cause you to consume between 200-275 calories LESS over the rest of the day. Adding lemon to this drink is also cleansing for the liver, which in turn helps with the detoxification process. And raw honey is believed to have the ability to actually mobilise stored fat to then be burnt off as energy, but don’t go overboard with honey as it is still classed a ‘free sugar‘. Be sure to buy a good quality Apple Cider Vinegar with the Mother if you want the best weight loss effects, plus all the other amazing health benefits of this super healthy vinegar. As lemon is just so cleansing for the liver this drink will also boost detoxification, and keeping the body detoxified is highly effective for weight management and can be a big part of the weight loss process. Couple this with a little raw honey with its fat mobilising effects and you have a great weight loss drink. 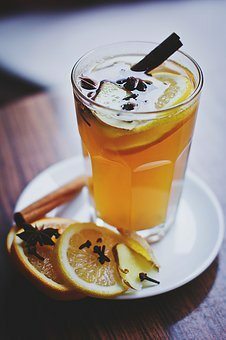 Having your warm lemon and honey drink first thing in the morning on an empty stomach is the best way to get this detoxifying drink straight into your system, and will totally get you going and glowing for the day. 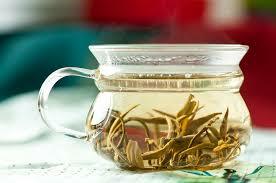 White tea is a source of powerful antioxidants and contains up to 3 times more polyphenols than green tea. 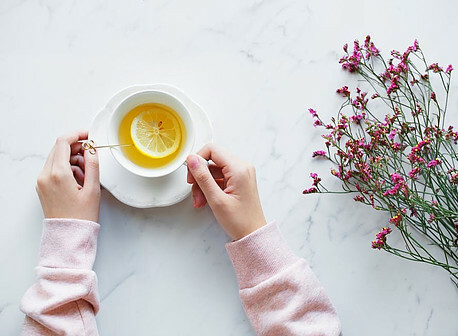 A study conducted by Nutrition and Metabolism discovered that white tea can boost the breakdown of fat and actually block the formation of fat cells. However, unlike green tea, the white doesn’t contain the the catechin EGCG which is an antioxidant unique only to green tea that is said to have many healthful benefits including being anti inflammatory, anti cancer, and good for cardiovascular health. You could alternate between green and white tea to reap the benefits of both, but do remember that both of these teas contain caffeine (though not as much as regular tea and coffee) and therefore are probably not ideal before bedtime. As a powerful anti inflammatory and antioxidant, turmeric truly is a superfood with many health benefits and helping to lower the inflammation associated with obesity is one of them. Its active anti inflammatory compound called curcumin is responsible for this, and can actually help to curb insulin resistance, lower blood sugar, lower high cholesterol, and help with the other metabolic conditions resulting from obesity. Making a warm turmeric milk before bed will also help you sleep, and is a delicious and comforting way to end the day. Warm some sugar free nut milk, either in the microwave or on the stove (coconut seems to taste the best, but any will work just as well). Add half a teaspoon of turmeric powder, and maybe a small amount of raw honey as a sweetener, and your’e good to go. Green super food powders are great metabolism boosting foods, and they are also my personal favorite as they just do so much more than just that. They are an easy, drinkable way to up your quota of those green vegetables we should all be eating every day but don’t always get time to. Superfood powders also contain very high amounts of free radical scavenging antioxidants that help mop up the damage caused by toxins from junk foods, chemicals, alcohol, sun, cigarette smoke, and environmental pollution; and they are also anti aging for both your body and brain. Keeping your body detoxified is crucial for weight loss! Keeping your body detoxifying as best as it possibly can is your number one key to a slimmer body. This is because harmful toxins that can’t be broken down and eliminated are often stored away in your fat cells for safe keeping, but they can actually contribute to obesity due to the fact that those fat cells have to keep swelling in order to accommodate these toxins; and here’s the kicker, the more they swell, the bigger you get – yikes, right? This is why it’s so very important to keep the body in high detoxification mode by eating a healthy diet of at least 7-10 portions of fruit and vegetables a day, which should include lots of green foods such as green superfood powders, plus other specific detoxifcation foods. These green powders are also high in fiber, which is another reason why they boost weight loss. Your body need lots of fiber to keep your metabolism fired up and working hard to break it down. Plus, super food has the added side effect of giving you a big energy boost fast, AND some great anti aging benefits to boot. Your skin, and YOU, will literally be glowing from the inside out when you start using these concentrated superfood powders every day. There are so many different green superfood powders to choose from that you may feel overwhelmed at first, but let me explain all to you. 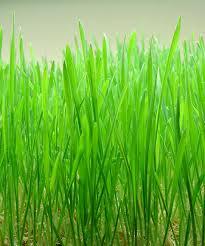 Firstly, you have the single powders such as wheatgrass, barleygrass, spirulina, moringa, chlorella, and other blue green algaes. These are all great, but it is much better to choose a blend so you get the best nutrients from all of them. Some good brands are Udo’s Choice Beyond Greens, OR my favorite by far, especially in the glowing skin stakes, is Dr. Schulze’s Superfood Blend. I love this stuff, and it was a game changer for me in terms of detoxification, immunity, and clear glowing skin. Cinnamon has long been used for its ability to control blood sugar (especially in diabetics). Keeping blood sugar stable is vital to keeping weight down, and cinnamon just happens to be great for just this, and it helps to keep off belly fat specifically which makes it even better. That is why it is also important to eat low GI foods to avoid the sugar crashes that promote weight gain. Low GI foods that boost metabolism come in the form of fruits, vegetables, wholegrains, proteins and healthy fats. To make this hot drink you can use cinnamon sticks (make sure they are the flaky variety, and NOT the hard rolls – see pic) as this type is healthier. You can infuse them in hot water with some raw honey, lemon juice, cloves, and ginger slices. All of these work together to boost metabolism; plus it tastes absolutely divine! TOP TIP – you can re-use the cinnamon sticks a couple of times to save wastage. Thanks for taking the time to read this post! If you know of any other weight loss tips, or drinks that you have already had success with, then I would love to add them to this list. Please feel free to share below. Pomegranate Health Benefits – A High Antioxidant Superfood! This is a really useful list for me to save. Thank you for taking the time to write out this. I was surprised by the water with ice trick! Hi Frazier, yes the iced water trick is a revelation isn’t it? But it does make sense that it would work as our bodies would need to burn extra calories to bring our core temperature back up again. This is one thing I am going to definitely going to try and test for myself. All these calories add up! Incredible information, its shame doctors don’t recognize people like you who have taken time to research and bring a healthy diet for our bodies. Wishing you all the best. Hi Pamela, your’e right, many doctors still aren’t on board with the whole healthy eating thing but I do believe it is getting better. I guess they are just trained in a different way and more towards pharmaceutical drugs. Still, times they are a changing and it’s fantastic that we all have the internet now so we can do our own research to decide what is best for our bodies. I drink a lot coffee but I know I’m drinking too little water so I will try find a way to drink more. Do you know a good way to remember to drink water on a daily basis? I got a a lot of inspiration by reading your post, and the warm lemon and honey in the morning seems like a winner. Hi Jan, I think the trick with getting enough water is to simply make sure you always have a bottle of it with you at all times, especially if you know your’e going to be going somewhere were it may be hard to get drinks. Just always have some in your car/bag/workplace etc. 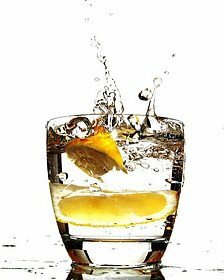 You could always spruce it up with some lemon or lime juice if you find plain water boring. 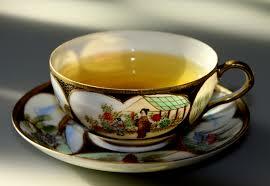 And yes, it’s great to start your day with warm lemon and honey as it’s a great mini detox to clear your system out. Even better if you can add a little apple cider vinegar also. What a beautiful website with informative content. I will be following you and taking your advice from now on! Aww thank you Courtney that’s a really lovely thing to say. I’m so glad that you like it and will be following some of my advice. I hope it helps you. Hi Roxanne, thanks for reading and I’m glad you liked the post! Hi Stefanie, Nice article with very useful information. I learned something new and it is good to know all you can regarding your health, especially options and alternatives to living a healthier lifestyle. Thank you! Hey there, thanks and I’m happy you have learnt something new. It’s always good to incorporate a few easy tips and tricks for a healthier lifestyle into your life. Sometimes they can just be simple things that all make a difference over the long term. That’s the philosophy I tend to live by these days and it seems to work. Everything in moderation, and always loads of antioxidants from fruits and vegetables along with metabolism boosting drinks like the ones in the post. This is so interesting. Somewhere along the line, I read that water was the best beverage and I’ve simply stuck with that. I don’t drink cold water though. Room temperature seems to work well for me. Hi Melinda, glad to hear your’e keeping it simple with the water. I tend to stick to green and herbal teas myself but I guess that’s more because I live in a colder county (well it seems like it is most of the year at least ha ha), plus I just find warmer drinks more comforting. Since researching for this post though I am going to try the cold water thing to see if it helps me to burn more calories – it’s worth a shot! Ahh I see you must be a dedicated coffee drinker then? ha ha. Glad you enjoyed the post and I hope the coffee works for you! Great post. Very informative. I have tried different methods but the success level was close to 0. The recommendations posted look very normal and practical. I think I should try some cinnamon. Thank you for sharing information. Hi Nadja, I’m sorry you have had little success with other weight loss diets. I know how hard it can be myself, hence why I dedicate my website to helping others to achieve health and fitness. There are so many myths about weight loss out there that it’s hard to know what works and what doesn’t. Thank you for sharing this post Stephanie. I have heard so much about turmeric lately, is this just the latest trendy “superfood’? I understand it has a lot of awesome benefits, but I am trying to figure out how to incorporate it into my diet. So, I can try this drink with almond milk? Do you recommend any particular powder or are they all the same? Sorry for all the questions, but you really piqued my interest here. Hi Steve, thanks for reading and don’t worry I love questions ha ha. Yes, turmeric is definitely one of the best super foods around and one of the ones that has now been ‘officially’ tested and found to be beneficial to health. It is a powerful anti inflammatory, and as most of us have chronic inflammation due to bad diets, toxins, pollutants etc then everybody could benefit from it as chronic inflammation is thought to be the root cause of many modern day diseases. If you are going to buy turmeric then you must be really vigilant with what you buy as so many supermarket versions are filled with artificial colours and sometimes fillers and other things that shouldn’t be in there. It’s pretty notorious for that, so make sure you only ever buy reputable brand organic to be sure you are getting a high grade product that will have all the benefits you are looking for. Yes, you can drink this with almond milk as I’m sure it would be delicious, probably needs something to sweeten it though. You can also add turmeric to lots of spicy dishes like curries, chilli’s, soups, and even roasted veggies…pretty much anything. But, I would say if you want a beneficial dose then I would take the time to make up the turmeric paste which I make and have all my family on (I’m determined they are going to live forever!). The thing about the paste is it has all the other ingredients to help your body absorb it really well, such as fats and black pepper, and it is easy just to store in your fridge and take a teaspoon of it as and when. Here is the link again to the post with the recipe, also you can read up properly about the awesome benefits. This is a really useful post full of herbal health tips rather than medicines. These drinks are great for every busy person who doesn’t get time for themselves and they look yummy too. Thank you Stefanie for sharing these amazing posts with all of us. Maintaining a healthy weight is so so important and this post has made our job far far easier. That’s no problem Sarah, yes I always like to keep things as close to nature as possible as it always gives the best results. Fortunately these drinks are just so easy to make for anybody no matter how busy, and they are made out of inexpensive every day ingredients. Just be sure to incorporate at least 3 metabolism boosting drinks a day for maximum benefits, and try to vary them. Thank you, Stefanie, for this good post. As you point out caffeine helps our metabolism work better so I do have a cup, sometimes two a day. With the honey and apple cider vinegar it’s like a miracle drink, it does work well but the trick here is to keep it up as one-time won’t help much. One more thing, honey makes a great sweetener. Hi Fred, I’m glad you agree on the apple cider vinegar, it is fantastic isn’t it? I do now every day have it in the morning with lemon juice and sometimes some raw honey and I just feel amazing all day. It is indeed a miracle drink it, cannot be denied. I enjoy coming back to your website since the first time, for your excellent and helpful posts. This one I really needed to read. My metabolism is off since I hurt myself and can’t be as active. It has affected my heart for cholesterol and I have a ‘fatty’ liver. I took note of all the information for the drinks and food. I do drink Apple Cider vinegar with honey but with Grapefruit jc squeezed in it as well. I also watched your video. Thanks again for another useful and informative article! Hi Patsy, I’m really glad you have have come back to check out the new posts on my website, it makes me happy that I have produced helpful and informative content that people actually want to return to. I can only imagine that that taking apple cider vinegar daily, and with grapefruit juice, will not only keep your metabolism fired up, but will also help your fatty lover problem. 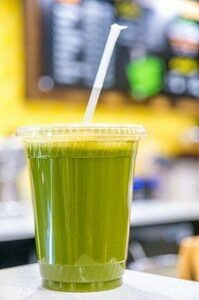 I drink this too every day and it really does act like a detoxifyer for the body, and also a detox for the liver which would be exactly what you need. Plus I find it really boosts my energy levels for the whole day, but then I do a whole host of other healthful things too, such as green superfood drinks and loads of fruits and vegetables so it is probably a mixture of all these things that keeps me in a state of good health, and not just any one thing. Thanks for reading, and please do return again! Oh, I love these drinks. I recently stopped drinking iced water, I thought it wasn’t that healthy. Usually, we drink a whole lot of pure water every day but now we stooped adding ice. Luckily we have moringa growing in our garden and this power food we use quite often. Not only for drinks but also as a food supplement, the leaves, and sticks. Oh Wow, that’s just awesome you have losing a growing in your garden, but then you do live in Thailand which is just full of wonderful tropical plants. It must be amazing! The thing with iced water is some people say it can be bad for your stomach, but I have personally never had a problem with it. You have to remember that it is only on this list as a weight loss drink as the body burns extra calories in an attempt to bring the body back up to its rightful temperature. So should probably only be used if you are trying to keep weight down, and even then you should see how it affects you specifically. Hope that makes sense. Hi Stefanie, awesome read. I struggle to find drinks that I like, especially in winter and while trying to shed some extra kilos. I am really looking forward to trying the two drinks that contain turmeric and cinnamon, two of my favorite spices. 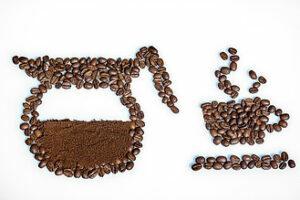 Drinking coffee gives me a boost, and I know I use coffee for energy when I am on a diet. Thanks for this info, easy to read, and very informative. Hi Denise, I’m glad you have some weight loss drinks that you like the sound of on here. 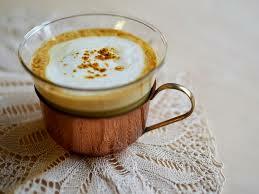 Turmeric and cinnamon latte are one of my favorites too, and really comforting and warming in the winter. I wish I could drink coffee for energy like you do, but I just can’t as it gives me anxiety and the jitters; however I don’t get this with other caffeinated drinks such as green tea, so I guess they have lower levels.